The only good source to obtain a Swissy puppy is from a breeder who shows their dogs, puts time and effort into studying the breed, selectively breeds the best males and females, obtains health clearances on all dogs they breed. The only place a puppy buyer should ever buy a puppy is from a responsible breeder. The great news is that there are good responsible breeders in all areas of the country that strive to produce strong, healthy puppies. But, how do you recognize the responsible breeder? 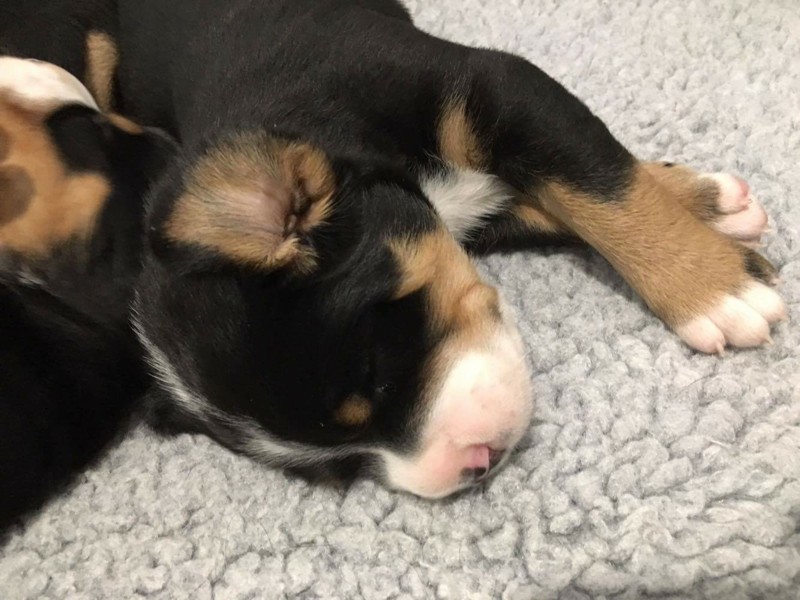 How can the puppy buyer know they are getting a puppy from a breeder who has the best interest of the breed in mind, rather than just the potential income? The first step is to locate breeders who are a members of the Parent Club. The GSMDCA (Greater Swiss Mountain Dog Club of America) is the Parent Club for the Greater Swiss Mountain Dog. Upon joining the club, GSMDCA members all sign an agreement in which they commit to never sell, supply, donate, or surrender a GSMD to wholesalers, pet shops or other retailers, raffles, catalog houses, laboratories, or shelters. This is the first step in knowing that the breeder cares about where their puppies go. Buyers are encouraged to read the GSMDCA Breeder’s Guidelines to aid them in their search for a puppy. Responsible breeders are more than happy to tell you about their dogs, the environment they raise puppies in and will welcome visitors. Dog quarters will be clean and well kept. Responsible breeders will ask you questions about your lifestyle, your home, and your family and other pets. Most breeders will require the buyer to complete an application and the buyer can expect a thorough interview. Puppies and dogs will be well socialized to children, other animals, and normal household noises. Puppies should already be introduced to the concept of eliminating at the proper place, though by no means will a young Swissy puppy be housetrained. Responsible breeders will test for common health issues in the breed. In Swissies, breeders should at minimum test hips, elbows, shoulders, and eyes. Some breeders also certify patellas, hearts & thyroid. Responsible breeders will screen breeding stock against genetic diseases to the best of their ability, but at this time, technology has not been developed to make screening fail proof. Good breeders will readily share health test results. Puppies will be a minimum of 7 weeks old, and preferably 8 weeks old or older, before they leave the breeder. Responsible breeders will pursue continuing education in the breed, should be a member of the GSMDCA, compete in dog shows and attend National and Regional Specialties. ​Responsible breeders will sell all puppies on a contract and companion puppies will be sold on sterilization contracts. Responsible breeders are happy to answer your questions, will encourage your questions, and will remain available throughout the lifetime of your puppy. Responsible breeders will insist you return the dog to them if you are unable to keep it for any reason. Contact breeders listed on the GSMDCA website. We are happy to refer you to breeders near you who may have a current or upcoming litter. Swissy Rescue assists Greater Swiss Mountain Dogs that don’t have a breeder to fall back on. If you have a big heart and welcome the opportunity to give a Swissy a second chance, please contact rescue to see what Sweathearts may be looking for a good home. Sadly, Swissies have become popular among Amish puppy mills and backyard breeders. Beware of any breeders who are not members of the GSMDCA, particularly if the breeder is from PA, IN, or OH where puppy mills are very prevalent.